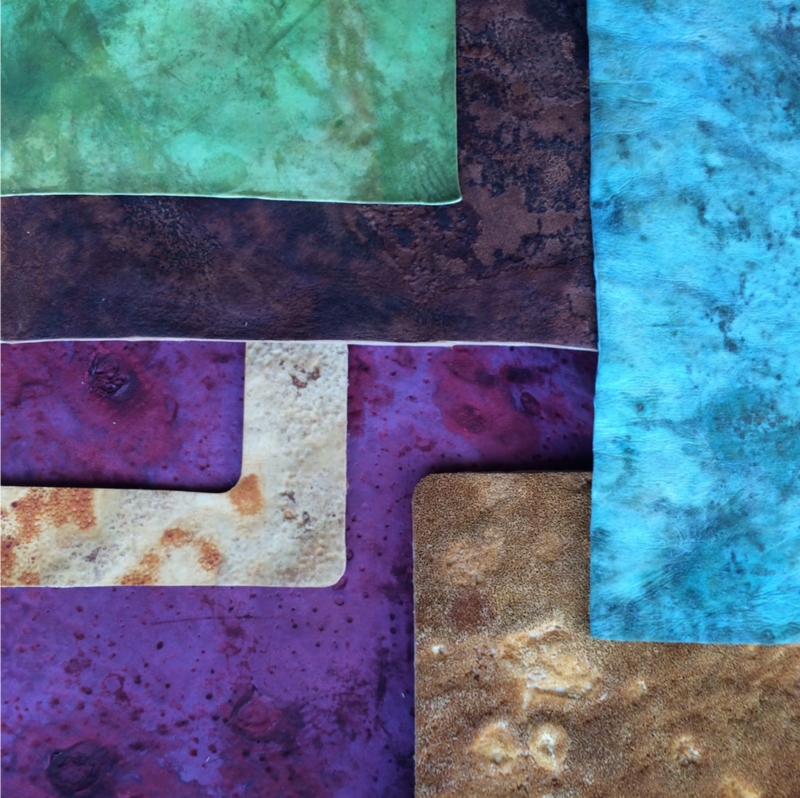 Mycelium-derived leather stained with various dyes. Credit: MycoWorks. MycoWorks, a San-Francisco-based biotechnology company, produce sustainable products and clothing directly from mushrooms. Their key ingredient is the “root” of the fungi, the microscopic mycelium, which form vast, collaborative underground lattice-networks beneath the forest floor. By cultivating and manipulating the fibres, the MycoWorks team can alter a number of properties of the final product, which acts as an environmentally-friendly replacement to leather. The company’s cofounder, Phillip Ross, also functions as the Chief Technical Officer of MycoWorks. With a background in art and design, plus culinary experience in the kitchens of New York, Ross began experimenting with growing mycelium in laboratories and clean rooms. He quickly became fascinated with the adaptive qualities of the fungal networks, which could be encouraged to form a variety of shapes and textures simply by altering the environmental conditions and chemicals added at various stages. Indeed, Phillip concluded that cultivating mycelium was like “learning a cooking technique”. When Ross and cofounder, Sophia Wang, started MycoWorks in 2013, they were at the very early stages of exploring the commercial applications of mycelium. They initially attempted to enter the construction market by creating fungal bricks from engineered ‘wood’, which they believed could replace common building materials. However, investors were concerned by the price of mycelium. A square foot of mycelia material costs $50 to make, whilst wood, cork and synthetic plastics can be produced at much more reasonable prices. Despite the setback, MycoWorks began to receive interest from clothing manufacturers as the apparel industry began to take notice of environmentally-friendly materials. It soon became clear to the team that they should restructure their fungi commodity and reformat their material into sheets akin to leather. The company’s leather sheets are made from the reishi mushroom, a tried and tested mushroom in its application for human consumption, safety of interaction with human skin and ease of cultivation. In nature, the mushrooms thrive on dead wood, secreting enzymes to break down lignin and exploit ingestible compounds in cellulose. In the lab, the team have been able to exploit the mushroom’s adaptability and grow mycelium using the readily-available nutritional waste resources of sawdust, corncobs and pistachio shells. Tissues of mycelia are stored in a jar, and within three to seven days, the mixture expands and forms clumps which are then moulded into a leather sheet, which can be dyed in different colours. Since the mycelium leather is non-toxic, grows on renewable inputs and is readily compostable, there are clear environmental benefits too. MycoWorks can also tap into a burgeoning audience of consumers who disapprove of the cattle leather industry yet still crave the luxurious smell and feel of leather. The leather can be in various textures and colours. Credit: Healthy Materials Lab. MycoWorks is entering the apparel industry. Credit: MycoWorks. A residency in the world’s leading life sciences accelerator, IndieBio, in San Francisco in 2015, helped the company craft its vision going forward. At the end of the six month incubator, each startup team has only five minutes to pitch to a room full of eager investors, who are all looking for a gap in the biotechnology market. When MycoWorks CEO Wang pulled out an entire six-foot hide of mycelium leather onstage during their pitch, it had become clear that MycoWorks had truly entered the realms of the lifestyle market. The company knows that their leather product has more uses than simply making household furniture and appliances, but also in the design of clothes. “People always advertise the materials that are on their bodies and very proudly tell their stories, and that doesn't seem to be the case with home-building," Ross says. "People don't talk about their drywall in the same way they talk about their watch." The major advantage of MycoWorks’ manufacturing methods is that they are able to alter several variables in the developmental process in order to fit customers’ specifications. For example, one can alter the concentration of nutrients, type of nutrients, timing in which nutrients are provided as well as adjust the surrounding light, humidity or gas levels. Additionally, the mycelium mixture maintains a growth relationship with whatever it is grown in. “You put it in a cup, it would take the shape of a cup”, Ross says. According to Italy’s Mogu agency, who specialise in developing and scaling up mycelium technologies, mushroom-based fabric can be tweaked to be as hard as enamel or as porous as sponge, using the variable conditions that MycoWorks have at their disposal. In fact, MycoWorks have even been able to produce bulletproof mushroom bricks which are capable of absorbing .38 calibre round shots fired at point-blank range. A product that can be as thin as paper, to make dresses or lampshades, and thick enough to absorb bullets is quite simply the ideal creative material. Mush-Lume Cup - Light Series. Credit: Danielle Trofe Design. The company continues to explore the commercial applications of mycelium products, and one would presume it may not be long before they translate their in-house products to a larger market. In fact, Mycoworks has recently announced that it is partnering with two global footwear companies to replace leather and foams in shoes with a soft, malleable and waterproof mycelium material. Since customers expect to pay a premium for high-end organic accessories, MycoWorks’ handcrafted products could be sold at a high margin. However, in order to translate their pioneering research into large-scale success, they will need to solve a few issues first. At the moment, a slab of mycelium of 27 square feet requires two weeks to produce, whilst clothing only lasts one or two years before it weakens and loses shape. As they experiment with scaling up production, concerns over speed of production and product durability will likely ease. Additionally, MycoWorks will likely have to deal with competition. Evocative, a New York-based biotech company have developed their own “Mycelium BioFabrication Platform”, and their products are used in the textile and scaffolding industry. The company has also partnered with designers to produce lighting collections for homes. With only a handful of about 100,000 known species of fungi to have been tested for industrial application, more companies will be sure to develop products of their own in the near future. The potential range of fungi-derived products is vast, and MycoWorks’ manufacturing approach, combined with an experienced team, means that they have a great chance to become leaders in this new market.